CSA Lessons and Challenges Carlos Sojo FLACSO Making Macro Social Analysis Work for Policy Dialogue. Social Development Department. The World Bank, May. 1 CSA Lessons and Challenges Carlos Sojo FLACSO Making Macro Social Analysis Work for Policy Dialogue. Social Development Department. The World Bank, May 16-19 2006 Washington DC. 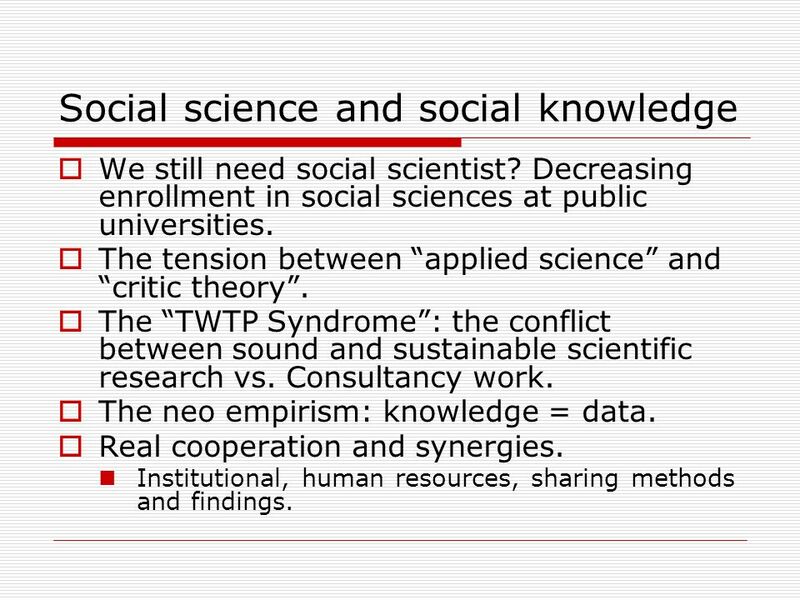 3 Social science and social knowledge We still need social scientist? Decreasing enrollment in social sciences at public universities. The tension between applied science and critic theory. The TWTP Syndrome: the conflict between sound and sustainable scientific research vs. Consultancy work. The neo empirism: knowledge = data. Real cooperation and synergies. Institutional, human resources, sharing methods and findings. 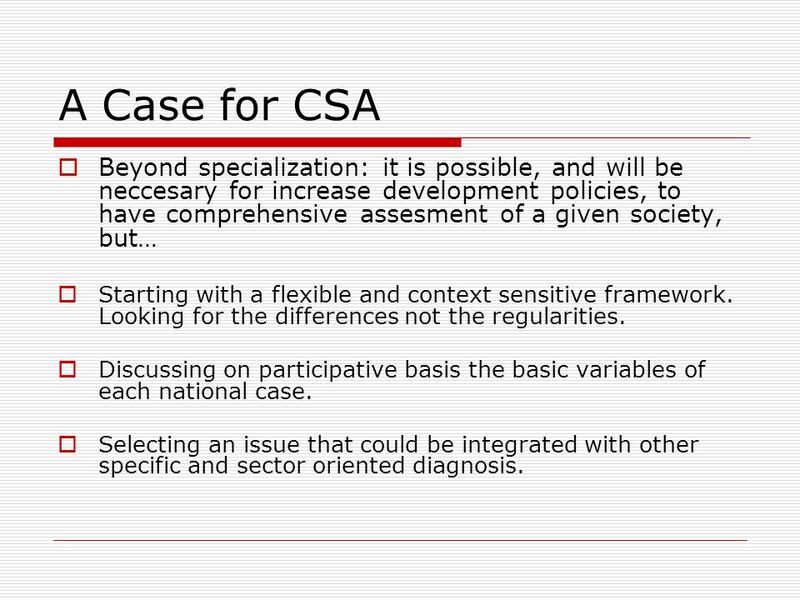 4 A Case for CSA Beyond specialization: it is possible, and will be neccesary for increase development policies, to have comprehensive assesment of a given society, but… Starting with a flexible and context sensitive framework. Looking for the differences not the regularities. Discussing on participative basis the basic variables of each national case. Selecting an issue that could be integrated with other specific and sector oriented diagnosis. 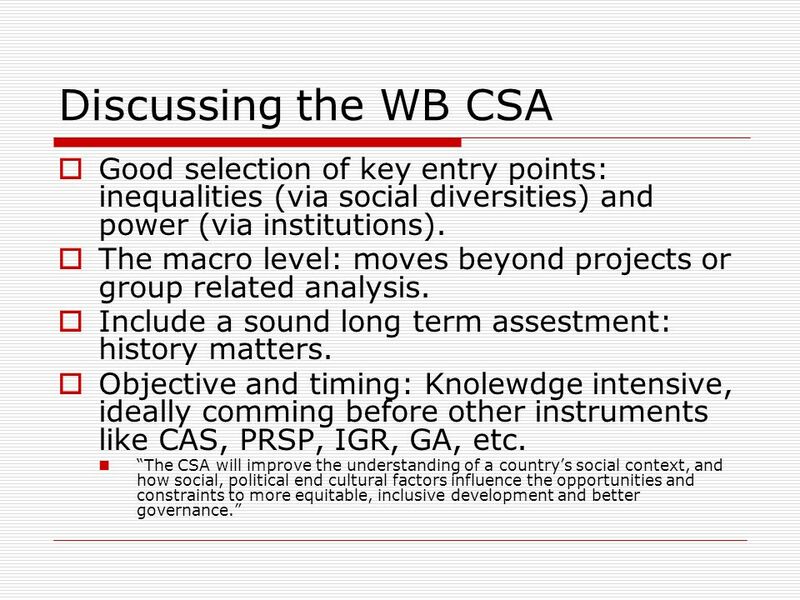 5 Discussing the WB CSA Good selection of key entry points: inequalities (via social diversities) and power (via institutions). The macro level: moves beyond projects or group related analysis. Include a sound long term assestment: history matters. Objective and timing: Knolewdge intensive, ideally comming before other instruments like CAS, PRSP, IGR, GA, etc. 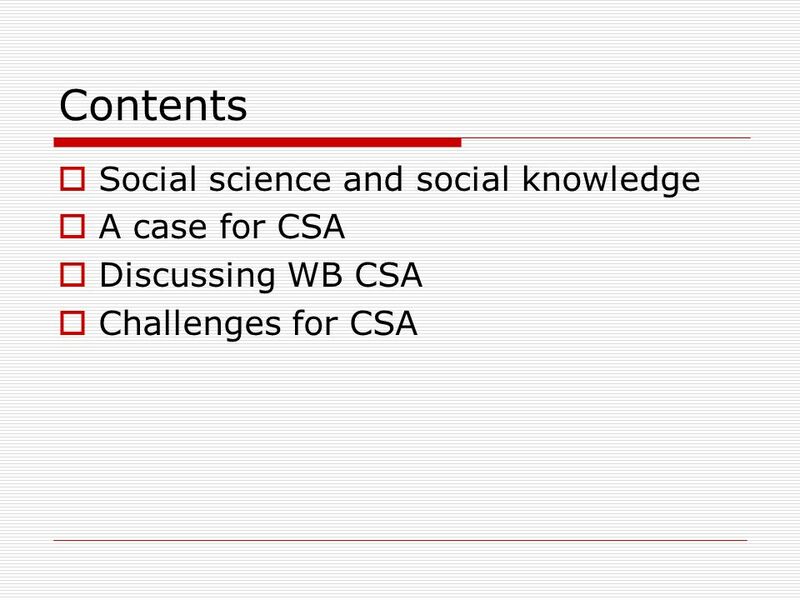 The CSA will improve the understanding of a countrys social context, and how social, political end cultural factors influence the opportunities and constraints to more equitable, inclusive development and better governance. 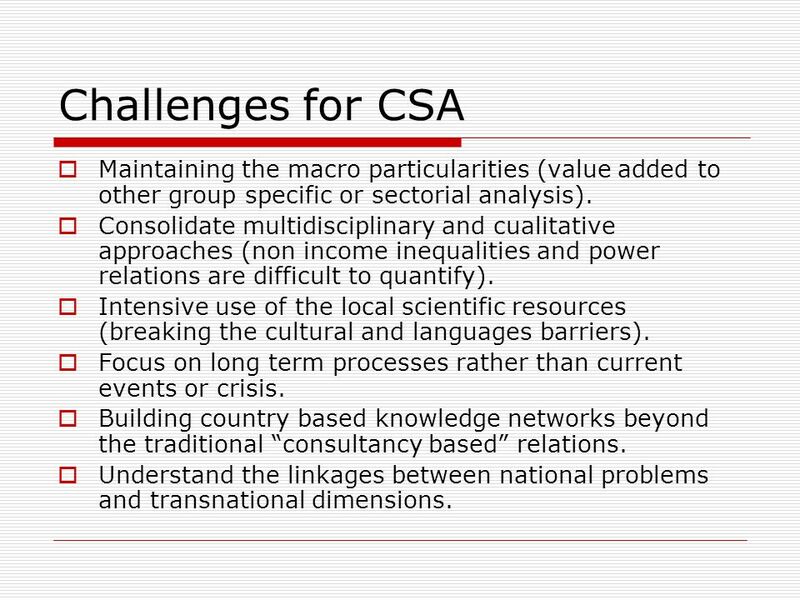 6 Challenges for CSA Maintaining the macro particularities (value added to other group specific or sectorial analysis). Consolidate multidisciplinary and cualitative approaches (non income inequalities and power relations are difficult to quantify). Intensive use of the local scientific resources (breaking the cultural and languages barriers). Focus on long term processes rather than current events or crisis. Building country based knowledge networks beyond the traditional consultancy based relations. Understand the linkages between national problems and transnational dimensions. 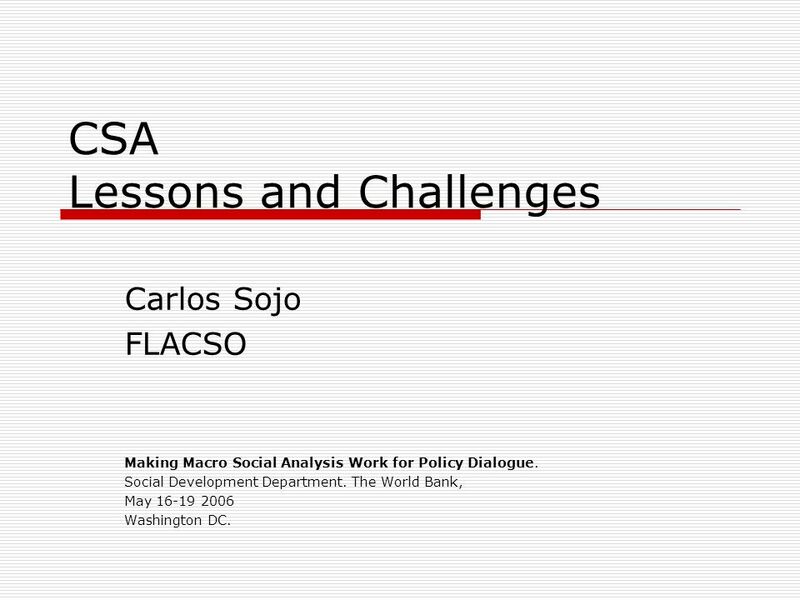 Download ppt "CSA Lessons and Challenges Carlos Sojo FLACSO Making Macro Social Analysis Work for Policy Dialogue. Social Development Department. The World Bank, May." Towards a Culture of Disaster Prevention and Risk Management Andean Programme for the Prevention and Mitigation of Disasters. Distilling or diluting: Addressing wicked problems at the research-policy interface Frances Cleaver Water for Africa Research Project School of Oriental. Environment & national PRSs - directions and dilemmas EPD Seminar Series May 2002. 21 ST CENTURY LAW AND DEVELOPMENT David M. Trubek Shanghai, June 2011. The role of Technology and Innovation Parks in Europe European Economic and Social Committee – Exploratory Opinion. Education through and for Change Alexandria Education Convention December 2012 Steven Stegers, EUROCLIO – European Association of History Educators. ORIGIN 2009 Annual Meeting Brussels, Belgium Country Office D&I Engagement Pilot The World Bank Group Thursday June 9, 2009. High Level Regional Consultation for Policy Makers to Enhance Leadership in Planning the National HIV & AIDS Response S P Aligning AIDS & Development Planning. AFRICAN UNION A FRAMEWORK FOR HARMONISED LAND POLICIES IN WEST AFRICA: an LPI – ECOWAS partnership Presentation to the World Bank Conference on Land Land. Recommendations to the Ministers of Education of Southeast Asian Countries From Seminar on Lifelong Learning Policy Frameworks in the Southeast Asian Countries.